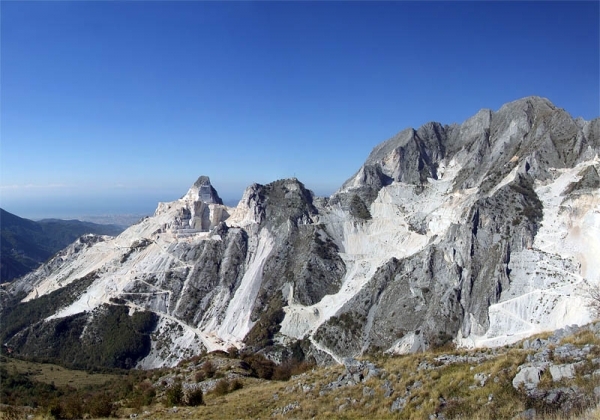 At about 1 hour and 30 minutes driving far from Florence, one of the most incredible landscapes in the world surprises visitors: the marble quarries on the Apuan Alps. In this area, rich in many stories and in human fights to the nature, the precious white stone has been excavated since Roman times and then preferred and used by important artists, one for all Michelangelo. It may happen to meet some old quarry men, living in the marble quarries area since their birth, a kind of legendary figures telling mysterious tales about this proud work. In the area of the Fantiscritti quarry, for example, one of these men created a small but fascinating open air museum, where it is possible to understand how hard, dangerous and, somehow, heroic, the quarry men life was in the past. This museum will be your first stop of the day, after enjoy a guided visit of a quarry: the first part of the visit takes place for about 3 minutes by minibus for the transportation inside the cave. Continue the visit by walking along a path (internal temperature 15/17°C) which is accessible to everyone, even to children…! All on one floor, walking on a marble floor that is the envy of the most beautiful cathedrals in the world. Shows the technique of cutting and machinery used for excavation. Total time inside the cave about 40 minutes. A another typical feature of these places is food: in the old times, people were really poor and had to “invent” cheap feeding. As a result of this simple gastronomic tradition nowadays “Lardo di Colonnata” is one of the most famous products of Tuscany. It is a delicious spiced lard obtained by an old local recipe, that can be tasted in one of the several “larderia” of the small village of Colonnata, where you are going to have a delicious lunch break. After lunch, you can decide if prefer to visit a sculpture studio, where it is possible to see how sculptors use this precious white stone for their works, or make a stop in the historical centre of Carrara for relax.